From wooded hills to sedge-filled wet meadows, from the briny estuary to freshwater streams, from salt marshes to rock outcroppings, the Neponset River Watershed is rich with nature. The Watershed contains a relatively large swathe of undeveloped land that runs through Canton, Hyde Park and Milton, and along the Neponset River, called the Fowl Meadow, which together with the Blue Hills, provides the most extensive area of wildlife habitats in Greater Boston. Northern Fowl Meadow, late-November 2011. Fowl Meadow is a large wetland system comprised of diverse landscapes, wildlife and plants, that is home to rare and endangered species. The river is placid along most of its Fowl Meadow path, falling only slightly, and with a lazy current. Interestingly, the Fowl Meadow contains several remnant “oxbows” of a former riverbed, which support a diverse community of wetland plants, aquatic life and terrestrial wildlife. 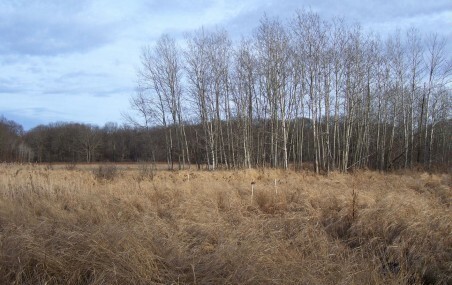 This large, undeveloped section of the Meadow was spared from the bulldozers by a coalition of organizations including the Watershed Association, which rallied to stop construction of the final leg of Interstate 95. A plan was for Interstate 95 to continue from its current terminus at Route 128, all the way in and through Boston, re-routing a mile of the Neponset River and filling the extensive marshes of the Fowl Meadow. Over the centuries, the Neponset River and its streams have been modified to suit various human activities and we experience the legacy of these modifications today. For instance, the remains of old dams on the river – as well as artificial widening of the river channel – continue to make waterway travel challenging for both wildlife (e.g., fish) and humans (e.g., paddling a boat) more difficult, especially during times of low flow. The site of the collapsed “rubble dam,” about 200 yards downstream of the Truman Parkway canoe launch, is one such challenging site. At the Watershed Association’s urging, there is an ongoing effort to get herring and shad (and recreating humans) past the Baker and Tileston and Hollingsworth Dams, especially by modifying or removing the dams. If the dams are removed or modified sufficiently, and the channel partially restored to a more natural shape, paddling through this stretch of the river will become much safer, easier, and less susceptible to low flows. At other points in the river, there are small, vegetated islands – another legacy of old dams. For example, downstream from Ryan Playground in Mattapan, the river enters a stretch of braided or “anabranch” channel where it splits into numerous small threads that weave their way through tiny islands covered primarily with Reed canarygrass. 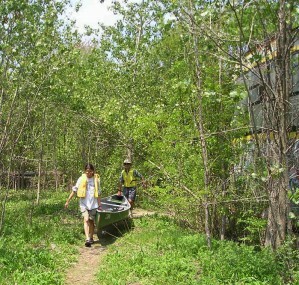 This area is sometimes referred to as the “wild rice islands,” although no wild rice has been observed here. Before 1955, this area would have been underwater, part of the mill pond created by the Jenkins Dam, which sat just upstream of the modern day shopping plaza on River Street near Central Avenue. The Jenkins Dam collapsed in 1955’s Hurricane Diane and ultimately was removed by the state. The small islands and braided channel were formed as the river carved a new route for itself through the thick deposits of silt that had accumulated behind the Jenkins Dam. The river changes character radically below Lower Mills, as we enter the Neponset Estuary. The intimate freshwater river, closed in by its buffer of overhanging trees, gives way to a wide-open waterway with sprawling salt marshes and sweeping views. Seasonal water levels are replaced by a twice-daily 10-foot change in the water level as tides ebb and flow. Finally, the river is no longer the solitary domain of paddle-powered craft, as larger motor and sailboats are now also able to ply the waters of the Neponset. An estuary is the area where a river meets the ocean. Freshwater and saltwater mix here, creating a unique habitat that is one of the most biologically productive ecosystems on earth. The marshes filter stormwater runoff, capturing nutrients and sediments and purifying the water. The estuary is a protective bulwark against flooding, as resilient salt marsh soils and grasses dissipate storm surges, protecting upland organisms as well as real estate. 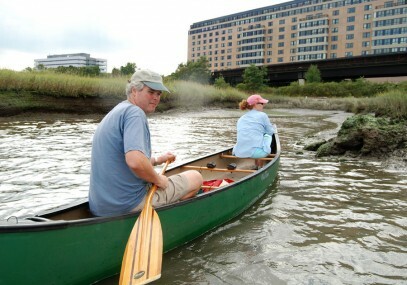 Paddling the Estuary, Sept. 2009. Photo: Tom Palmer. The Neponset Estuary provides habitat for a variety of wildlife, including all manner of sport fish and over 200 different bird species. Despite its proximity to Boston, many of the estuary’s open spaces and habitats are still intact, thanks to the vision of Charles Eliot, founder of the Metropolitan District Commission, who recognized the need to protect the Neponset’s marshes more than 100 years ago. In March, April, and May, the area just below the Lower Mills Dam is one of the most productive spawning areas for rainbow smelt in Massachusetts Bay. Smelt are small “anadromous” fish, which spend most of their lives in the ocean, but return to brackish water to spawn. The smelt spawning area stretches from the railroad bridge near the Milton Landing, right up to the toe of the Baker Dam, in a natural gorge where night herons, cormorants and even eagles congregate on overhanging limbs to get their share of the spring fish feast. Pope John Paul II Park comes up on the left. This area used to be the Hallet Street Dump and Neponset Drive-in movie theater. The State converted the former landfills into parkland, which now serves as the active recreation centerpiece for the Neponset Greenway. Before these areas were turned into the park, the old landfills were first sealed off with a waterproof cap to prevent rainwater from soaking into the old landfill and then leaching into the river. Davenport Creek emerges into the Neponset in the middle of Pope John Paul II Park. 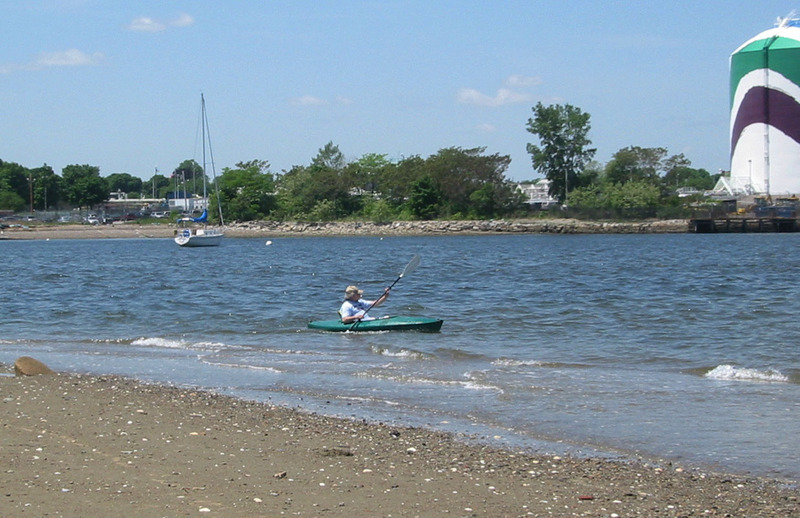 Paddling the estuary by Squantum Point Park, May 2007. From here out, the river continues to widen and deepen as it travels two more miles to its mouth at the beginning of Dorchester Bay. On the Quincy side of the river to the right, is the Neponset RiverWalk, which connects with the Neponset Greenway on the Boston side of the river. The first creek on the Quincy side is Sagamore Creek, which emerges from the buildings and vast parking lots of the State Street South development. Further downstream on the Quincy side is Billings Creek, which is surrounded by salt marsh. At the landmark, painted gas tank, the river is flanked by Tenean Beach in Dorchester on the left and Squantum Point Beach in Quincy on the right.